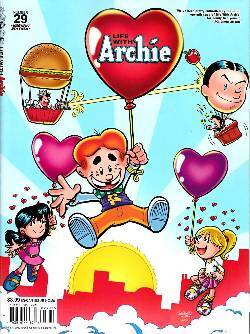 "Archie Marries Veronica" - Kevin is rarin' to go for his first political debate! While gun cnotrol laws had previously been the centerpiece of Kevin's campaign, the issue of marriage equality has taken center stage in a showdown with his political opponent. Meanwhile, Archie struggles to gain control of Mirth Music, pushing quality artists over manufactured ear candy. Will his gut instincts pay off? Not to mention Betty's got the reality TV blues as her fights with Reggie are escalating in order to keep the show alive! Can their relationship survive the fake melodrama? "Archie Marries Betty" - An alternate reality finds Archie lonely for companionship as Betty's crazy busy schedule makes it so he's practically single again. Can his parents reassure him it'll get better? Meanwhile, Jellybean earns more responsibility at her brother Jughead's diner, but is her shifty boyfriend looking to take advantage? It wouldn't be Riverdale if love wasn't in the air as Cheryl may be on the verge of a budding relationship and even Mr. Weatherbee is on the dating scene!